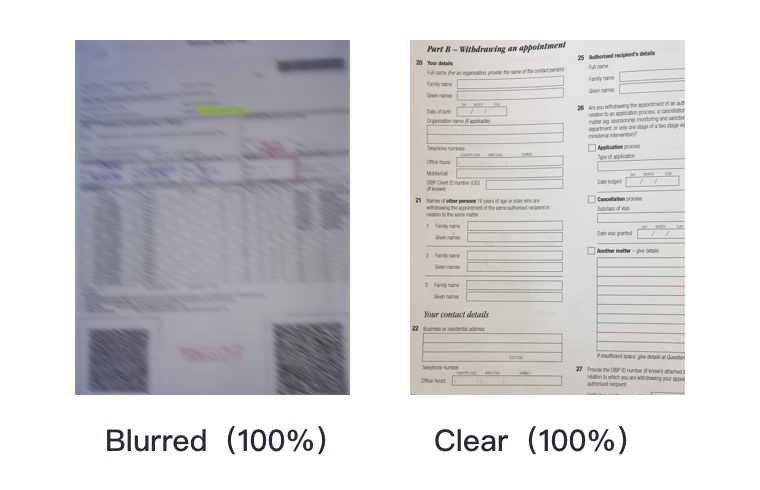 Image Clarity Detect uses the DNN models to detect whether the uploaded enterprise form image is clear or blurred. It can be integrated into business systems requiring image upload. Fees start as low as ¥0.0053 per API call for commercial services. Leverages the DNN models to detect and score image clarity. Supports customizable scenario recognition for more refined recognition results. Proven stability demonstrated by years of experience in handling complex enterprise scenarios. Delivers one-stop solutions that support RESTful APIs and SDKs for easy use and integration, requiring less manpower and IT expenditure. Evaluates the clarity of the data form images uploaded by enterprise users, preventing unnecessary duplicate uploads. Accurately detects and scores image clarity. Automatically detects blurred data form images, reducing manual review and improving work efficiency. Checks whether images uploaded by users are clear or blurred. Scores the clarity of images uploaded by users.